Although we do not offer direct Vaujany airport transfers, we can take you most of the way. Vaujany is connected by pistes to Alpe d’Huez but it is accessed by a completely separate road which comes up from Rochetaillee, a small hamlet close to Bourg d’Oisans on the valley floor. From these towns you would need to make your own travel arrangements for the short journey to Vaujany. More details about this can be found in the section below. We therefore do not offer direct Vaujany airport transfers from Grenoble Airport and you would need to select a transfer to Rochetaillee or Bourg d’Oisans on our online booking form. Our buses will connect you with Grenoble International Airport throughout the 2018 / 2019 winter ski season. We start on the 15th December 2018 and finish on the 20th April 2019. We have a service that connects with almost every single scheduled flight into and out of Grenoble Airport. Our Saturday prices to Rochetaillee are £46.90pp Return & £27.90pp Single, but with our group and child discounts, you could pay as little as £41pp Return. We will drop you off at and pick you up from the main bus stop in Rochetaillee, next to the Hotel Belledonne. Please see our ‘Children’ page to see our policy on carrying children. 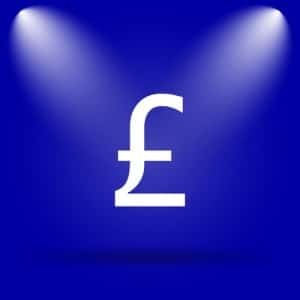 Click this link if you wish to Book Now or receive an Instant Quote for your group. Vaujany is a beautiful ski resort sitting at an altitude of 1250m. It is linked to Alpe d’Huez by ski lifts and forms part of the Grand Massif ski domain. The Telepherique Alpette will take you from Vaujany to an altitude of 2050m in about 7 min. From here you can access the whole ski area. Vaujany is very popular with families due to its tranquil environment and varied accommodation options. It retains the charm of a traditional French alpine resort, with most of the chalets built of wood and stone. It’s not exactly a party town, with very few bars, so it’s not an ideal place for young groups. It has great facilities for such a small resort, including an ice rink and a leisure centre with a swimming pool and Turkish bath. To get from Rochetaillee to Vaujany you have 3 options. We would recommend a booking a taxi as the cost is very reasonable and it gives you the flexibility should you arrive in Rochetaillee late, due to traffic or weather conditions. 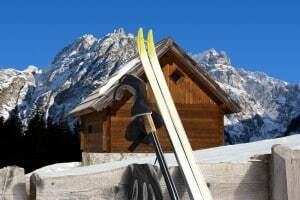 Our ski transfer buses will arrive in Rochetaillee about 1 hour 15 minutes after they depart Grenoble Airport. The taxi company should supply you with details on how you co-ordinate meeting in Rochetaillee. Bourg d'Oisans is the main transport hub for the area. There is a frequent bus service that departs from Bourg d'Oisans for Vaujany at week-ends, although they are less frequent on weekdays. All these services do pass through and stop at Rochetaillee. 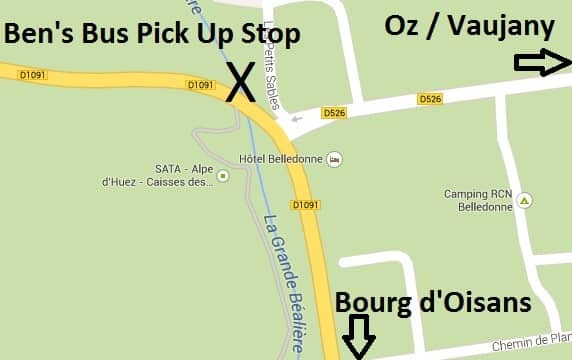 If you decide to take this option, please bear in mind that the Rochetaillee bus stop is quite isolated and there are better waiting facilities at Bourg d'Oisans. The serice is run by a local company, the VFD. Visit the Transisere website and put your dates and times into the left hand side booking form "Itineraire" to find the times of connecting buses. A private taxi from Rochetaillee to Vaujany costs around 45€ for up to 4 of you and takes around 25 minutes. There are a few taxi companies in the area and we would strongly recommend you book these as far in advance as possible, as they can get very busy. There is a free shuttle bus that runs up and down from Vaujany to Rochetaillee and the Tourist Office can help you with details of this. It is not that regular and the timings may not work for your Ben's Bus so it is strongly advised to check this all out in advance with the Tourist Office. A copy of the timetable, as we believe it to be, can be seen below but these times should be checked with the tourist office. Grenoble Airport is easily the closest airport to Vaujany, at less than 1hour 45 minutes away. This is why we only operate our Ski Transfer shuttle service to Rochetaillee from Grenoble Airport. If you really cannot fly into Grenoble, we would recommend checking out the Tourist Office for Vaujany for alternative travel options. The Vaujany Tourist Office is located at 4 Place du Téléphérique - 38114 Vaujany, just up the hill from the Hotel L'Etendard on the Route du col du Sabot. They are very helpful and they can help you find accommodation, arrange taxis and offer advice on the resort and its facilities. Vaujany has a large selection of accommodation options, including hotels, chalet, apartments and French style "Residence". It also has a few shops and small supermarkets, cafes and restaurants, a cash machine and a few sports shops. It has a very good leisure centre with a swimming pool, jacuzzi, sauna, Turkish bath, ice rink and 4-lane bowling alley.